Growing exceptional hops requires a blending of art and science, looking not only at quantitative measures of quality, but placing true value on how our hops perform in beer. Our approach to growing exceptional hops has four main components, with each component driving a cycle of continuous improvement, in pursuit of a better hop to make a better beer. Research and Development. Our research and development program has two focuses: finding new and interesting hops that perform exceptionally in beer, and bringing out the full potential of flavours and aromas from current varietals. 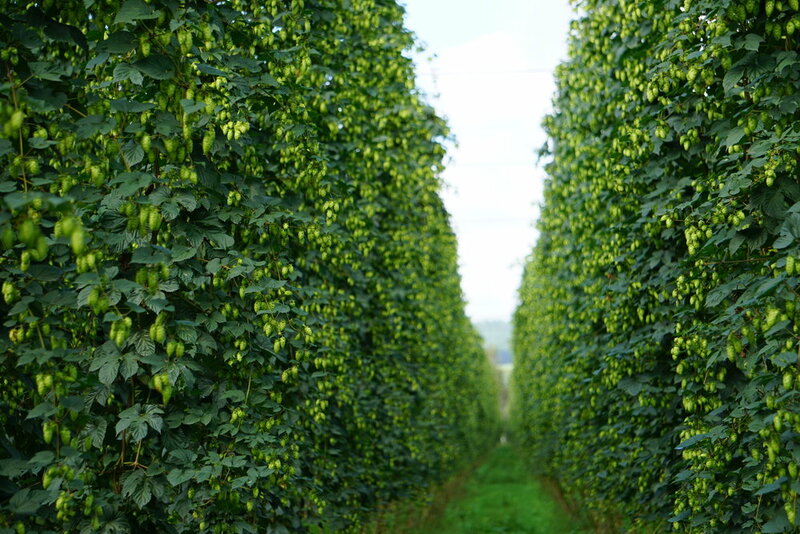 Our carefully designed research program looks at all aspects of hop quality, not just breeding. Each part of the process receives rigorous scrutiny, from our terroir, breeding practices, harvesting, drying, bailing, pelletizing, right through to packaging and storage. Everything that happens on the farm affects hop quality and all these areas of research and experimentation are integrated into our trial brewing efforts. Growing and Processing Techniques. Precise, consistent, and intelligent growing and processing techniques are key to growing extraordinary hops. Precise and controlled processes allow us to consistently produce high quality hops, and to make changes at critical points, in response to feedback from brewers and our trial brewing efforts. 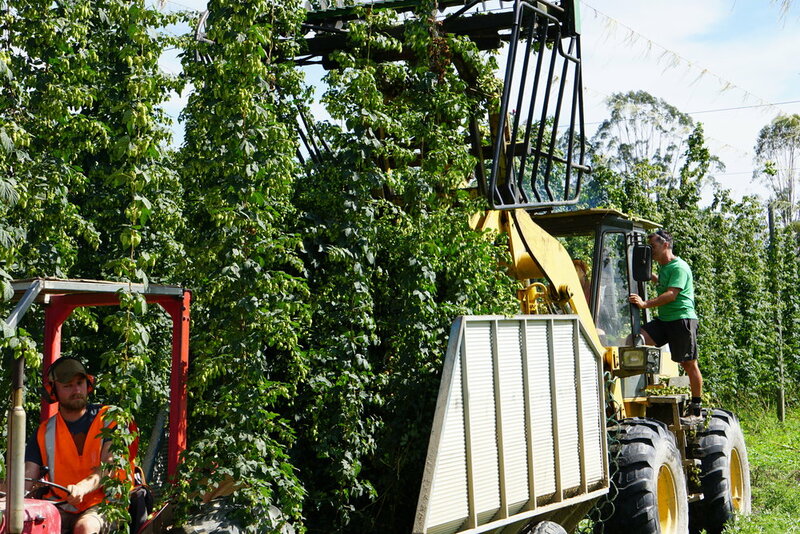 Technology is a key component of our growing and processing strategy, allowing us to have our finger on the pulse of the hops as they grow, and enabling us to precisely control our harvesting and processing. Detailed information gathered at each stage allows us to pinpoint places to make adjustments. In-field and aerial sensors give us continuous information about soil conditions and nutrient levels, allowing us to precisely see the growing conditions and to pinpoint what the plants need to produce specific qualities or characteristics. 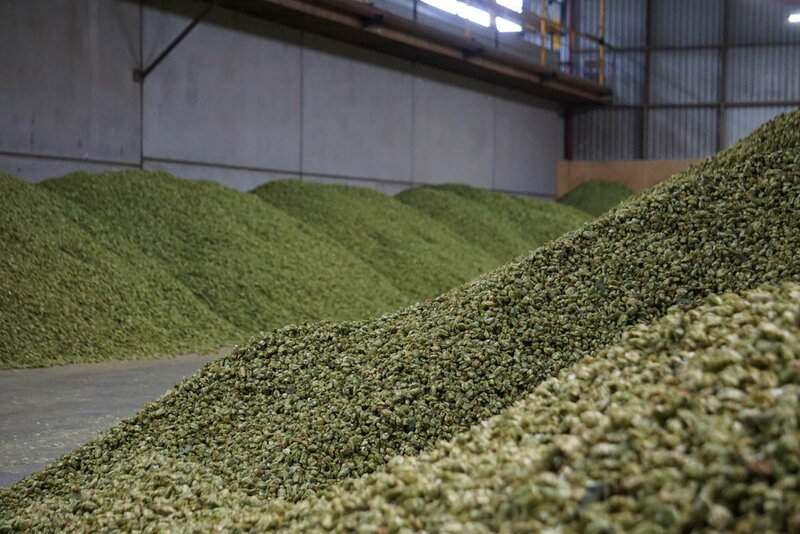 Critical information is gathered throughout processing to ensure that our hops are dried, bailed, and pelletized using consistent methods that ensure quality at each stage. Trial Brewing. Our Trial Brewing partners lie at the heart of our approach to growing exceptional hops. This program provides crucial information about how our hops perform in beer, the true measure of their quality. Our experiments are trialed by some of the world's most talented brewers to get a true sense of the impact of our efforts on the brewing qualities of the hops. The results of these invaluable efforts by our partners yield meaningful information about how the hops perform in applications that are truly relevant and whether our efforts are actually impactful. Brewer Feedback. The information we gain from brewers about our hops is the final key component of our approach. We aim to cultivate meaningful relationships with brewers that use our hops. These relationships give brewers a deeper connection to the source of one of their key ingredients and gives us the feedback needed to make our hops even better. Transparency is key, therefore we provide detailed yet understandable information about our hops and our growing and processing techniques. We utilize the feedback we receive from this mutually beneficial relationship to make specific adjustments in our processes and techniques. Our approach to growing hops is dynamic, compelling us to constantly improve. Each component of the cycle is critical, allowing us to make the kind of improvements that meaningfully impact the quality and character of our hops, and enabling us to keep pushing boundaries in hops quality, uniqueness, and performance in beer. Everything we do on the farm impacts the hops we grow. We actively invest in research and development to improve our growing, picking, and processing techniques. From upgrading equipment, to inventing new equipment and installing technology to help us closely monitor and study each step of the process, here is a look at some of the ways we have invested in and are experimenting on the farm. Installation of a fertigation system. We have installed a fertigation system to allow us to precisely control water and fertilizer in individual blocks. Fully automated bailing system. 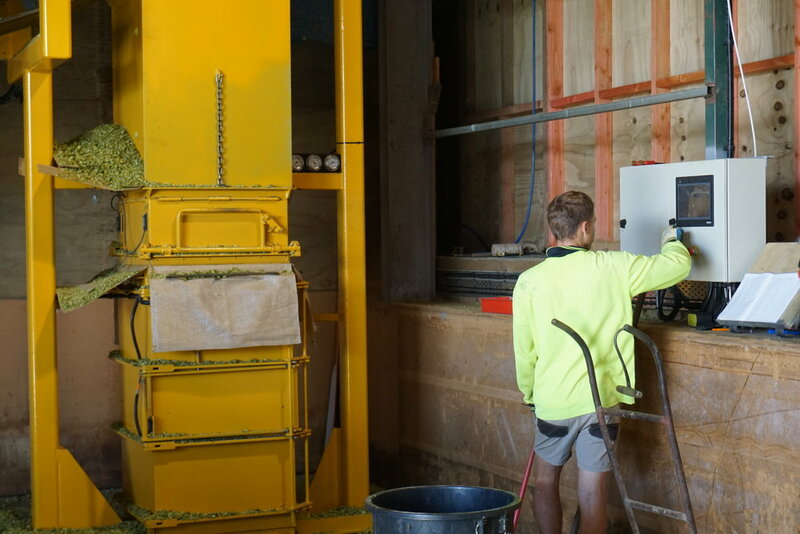 We have installed a fully automated bailing system that allows us to precisely control the final weight and compression of bales. This system ensures that no bale is over-compressed or unevenly pressed. Sensors in the kiln. Moisture and temperature sensors in the kilns allow us to accurately control the drying process, ensuring that the hops are dried to precisely the right moisture and at the lowest temperatures possible. Soil sensors in the fields. Soil sensors in the fields give us detailed information on macro nutrients, water and temperature. This allows us to closely monitor watering and fertilizer applications and avoid excesses or deficiencies of either. Multispectral camera. We use a multispectral camera which allows us to monitor plant health and stress. We hope in the future to use this to optimize production of certain desirable compounds in the plants through intentional, but controlled stress and further optimize harvest timing of each varietal and block by giving us a greater depth of information on cone maturity. Sensors and controls on the picker. 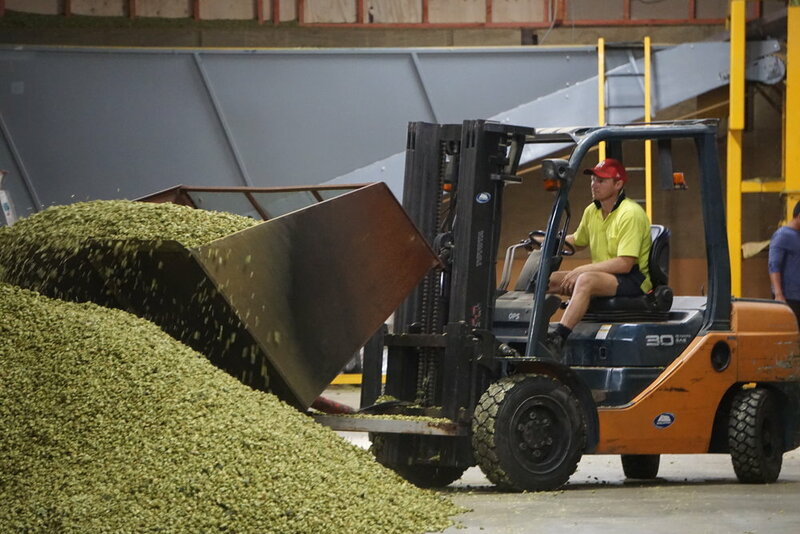 Sensors, control systems and variable speed drives on the picker enable us to precisely control each part of the picker, increasing efficiency and allowing us to be gentler when we process the hops. Since we grow, pick, dry, bale, and pelletize our own hops we have absolute control over their quality. We are dedicated to creating exceptional hops, and know that each part of our process leaves an indelible mark. We are passionate about growing hops and enjoying the beers created with them. Drawing on a diverse range of experience, each member of our team brings their own unique skills and experiences. Dave Dunbar. CEO. Dave is responsible for setting the direction of Freestyle Farms, providing a global view and the unwavering vision to pursue quality at each step, ensuring that our sights are firmly fixed on the goal of producing exceptional hops so they can be used to make exceptional beer. Dave is from San Diego, California, the epicenter of craft beer and is a passionate craft beer consumer with a background in Finance, Real Estate, and Bioinformatics. Sean Riley. General Manager/Head Grower. Sean runs the farming operation day to day at Freestyle Farms. He is responsible for our growing, harvesting and processing practices. Sean has long time experience growing hops, and has gained valuable technical skills growing a wide variety of other quality and process intensive crops. 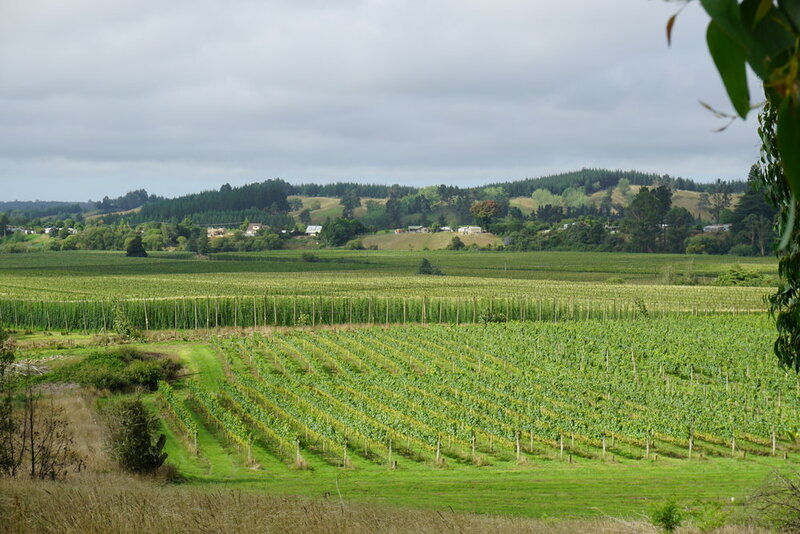 Sean first started growing hops when we was 18 years old and has since gained experience on a global scale at several agribusinesses in Australia, including olives and strawberries. This has given Sean an amazing perspective and a broader view of what is possible. Sean has a particular interest in technology that allows us to see what is happening at each stage of the hops growing process. Richard Schneeberger. Head of Crop Science, Quality Assurance, and Sales. Richard spearheads our Breeding, R&D and Quality Assurance Programs for growing, harvesting, processing, and packaging of the hops. Richard is an avid home brewer, with a wealth of experience brewing beer and working with hops and yeast. He has a PhD in Molecular Biology, with a background in plant breeding and genetics. Richard has a depth of scientific knowledge that he is now applying professionally to beer and hops.